Do I have to use a bucket? You can use anything that holds water. You can use a plastic tote, a glass jar, a coffee can, a metal trough, a plastic or steel drum, an aquarium, or even a homemade wood box lined with thick plastic. You could even use a large 300-gallon IBC tote. Just make sure that the container is clean and not made of anything toxic. If you use plastic, try to use HDPE, which has a #2 marked on the bottom. Plastics marked #1, #4 or #5 are also acceptable. Also, if the container lets in light, be sure to wrap it with aluminum foil or paint the outside to keep the light out. Is it safe to eat plants grown in a plastic bucket? I believe it is safe. Just make sure that the plastic is NOT marked #3, #6, or #7, these are not safe. Plastics are all around us these days, they are hard to avoid. Many of our foods and beverages come packaged in plastic. Recent studies have shown that many plastics contain estrogen-like chemicals such as BPA, which can leach into our food and water. More research is needed to determine the long-term health effects of exposure to these chemicals. If you are concerned about using plastics, consider growing in a glass container, such as the 1/2-gallon Ball canning jars. These jars are made of thick glass, and are inexpensive. Ball also makes lids which can be cut with a hole saw to hold the net-pots. This post shows an example of a lettuce plant grown in this way. Is Bucket Hydroponics considered organic? It depends. If you are using a synthetic fertilizer composed of inorganic salts (like Masterblend 4-18-38), then you are NOT growing organically. However, it is possible to grow using a fertilizer derived from organic sources (such as fishmeal, kelp, bat guano, etc.). The Botanicare Pure Blend Pro series is one type of organic fertilizer, and it has been reported here to work well in Bucket Hydroponics. How big should my container be? The size of the container depends on what you are trying to grow. If you want to grow 1 lettuce plant, you could grow in a small half-gallon or 1-gallon container. For 3 lettuce plants, grow in a 3.5 gallon bucket. For 3 basil plants, grow in a 5-gallon bucket. For large plants such as tomatoes or cucumbers, grow in a 32- or 45-gallon trash container. If your container ever gets low on hydroponic fluid, you can always add fresh fluid, up to 1/4 of the container volume at any one time. Don’t add more than 1/4 of the volume, or you risk drowning the roots and killing the plant. Are there any plants that should NOT be grown using Bucket Hydroponics? Just about anything can be grown. Plants that require space for a large root or bulb to form (such as carrots, beets, radishes, potatoes and onions) may not do well using rockwool cubes in small 2-inch net-pots. To allow space for the growing root to develop, modifications need to be made, such as using loose perlite as the growing media and using larger net-pots. Can I grow different types of plants in the same container? Yes, but only if the plants use water at approximately the same rate. For instance, you can grow lettuce and swiss chard in the same bucket since these are both leafy greens. However, lettuce and tomatoes should not be grown together, because the thirsty tomato plant will grow quickly and send roots deeper into the container, leaving the smaller lettuce plant high-and-dry. Should I add aeration to the bucket? Aeration is an additional complication to an otherwise simple setup. Bobby Smith (aka MHPgardener) has conducted an experiment in the video, and he concluded that while aeration results in slightly better growth, the plants grown without aeration still did pretty well. In my own experience of using aeration to grow Swiss chard in the post, I found that aeration actually decreased the size of my plants, so I am not convinced that aeration is worth bothering with. Keep in mind that air pumps can also be noisy, which may be bothersome if you are growing inside your home. How is Deep Water Culture (DWC) different from Bucket Hydroponics? Deep Water Culture is just another form of Bucket Hydroponics. In DWC, the hydroponic fluid level is NOT allowed to drop away from the plant, so the roots are always completely submerged. This is accomplished by either refilling the growing container on a regular basis, or by growing the plants on a ‘floating raft’. To make sure that the plant roots are getting enough oxygen, it is necessary to aerate to the hydroponic fluid using an air pump and air stones. Optionally, a water pump is used to circulate hydroponic fluid out of the reservoir and onto the base of the plant. Do I have to use rockwool for starting seeds, or are there other options? I have found that the 1.5-inch rockwool cubes work great, so this is what I use exclusively. However, you can start your plants in anything that will hold moisture, such as peat moss, perlite, etc. I would avoid anything containing compost (such as potting soil), since this will foul-up your clean hydroponic fluid. Do I have to start my plants from seed, or can I just buy them from the nursery? I recommend starting your plants from seed, since it is so much cheaper than buying plants from the nursery. If you order seeds online, you will find a much wider selection of plants than any nursery can carry. Also, nursery plants are grown in potting soil which should be removed, resulting in shock to the plant. If you do buy plants from the nursery, try to gently remove all the potting soil from the roots by rinsing in water, and then use a growing medium like Hydroton grow rocks to hold the plant in the net-pots. Store them in an air-tight container in your refrigerator. Keep each seed packet tightly sealed. If you can find some silica desiccant packs, throw them in as well to prevent any moisture from getting to the seeds. Kept in this way, the seeds will last for several years. Visit the Seed Storage page for more information. Do I have to use 2-inch net-pots? You can use a larger net-pot, but I have not found any reason to. Even large plants, such as tomatoes and cucumbers, can be started as seedlings in the 2-inch net-pots. Should I have an in-ground garden, or use Bucket Hydroponics? Why not grow both ways? 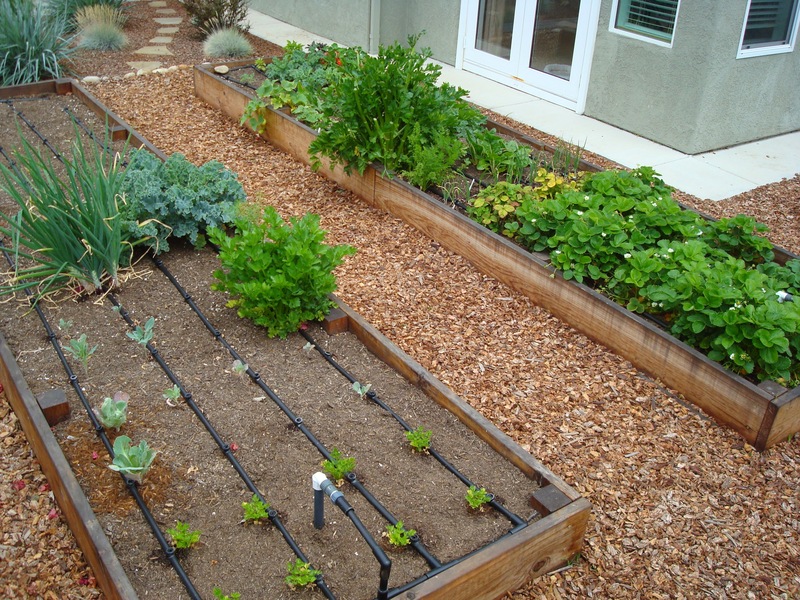 If you have a yard, and the time and strength to put in an in-ground garden, you should definitely do it. There are plenty of crops that will do great in a summer garden, such as tomatoes, cucumbers, peppers and zucchini squash. Other plants, like lettuce and basil, will do OK outside, but it might just be easier to grow them inside in a bucket. Inside, you can control the temperature, and you won’t have to worry about any pests or diseases. Alternatively, you could maintain an outdoor garden in the spring, summer, and fall, and then have an indoor winter garden using Bucket Hydroponics. What led you to start growing with Bucket Hydroponics? I used to live in a house that had enough room for an outdoor garden, so I removed the grassy backyard and installed large raised bed gardens. I used the Square-Foot Gardening method of Mel Bartholomew, and I had a lot of fun growing this way. Later, I moved into a house with no yard, just a concrete patio. To keep my gardening hobby alive, I had to find a new way. I eventually found the MHPgardener videos on YouTube, which introduced me to the Kratky Method of Bucket Hydroponics, and I have been growing this way ever since.